"Users have great things to say about the Copco Lazy Susan, writing that it turns easily, even when loaded with heavy items like canned goods." "It is the perfect size for storing spices, and you really can’t beat the reasonable price of this unit." "Design features a thin lip to keep items in place while still maximizing surface area, and the...turntable is textured to minimize slippage." "This high-quality wooden lazy susan will look right at home on any kitchen table. It’s 18” in diameter and 1.25” tall"
"Designed specifically for use in corner cabinets. It has two “kidney-shaped” tiers that come in a variety of sizes, ranging from 24” to 32” in diameter." "This beautiful lazy susan is made from real stone, and it would be the perfect centerpiece for your next dinner party." "Divided into five compartments, and it spins 360º for all-angle access...perfect for storing snack bags, food pouches and other...items." One of the most common uses for lazy susans is in the pantry or kitchen cabinets, as they can help you access spices, condiments and more. If you’re on the hunt for the perfect lazy susan to use in your cabinets, you should definitely check out the Copco 2555-0190 Non-Skid Pantry Cabinet Lazy Susan Turntable. This best-selling product has thousands of positive reviews thanks to its careful design and superior performance. This particular lazy susan is 12” across and 1.5” high, but it also comes in several other sizes, including 9” and 18”, allowing you to choose the option that will best fit your cupboards. The plastic turntable has a small lip to keep items from falling off, and it’s lined with a non-skid material to prevent its contents from sliding around. Users have great things to say about the Copco Lazy Susan, writing that it turns easily, even when loaded with heavy items like canned goods. Many note that they love the non-skid surface, as it keeps items from going flying if you accidentally spin it too fast. Overall, this is a top-rated lazy susan for cabinets that comes at an incredibly affordable price. For double the storage space, you need a two-tier lazy susan. Multi-level turntables are ideal for bigger cabinets, and one of the best products available is the Sagler 2 Tier Lazy Susan Turntable, which reviewers claim is sturdy and efficient. The Sagler Turntable measures 10” in diameter and 6” tall. According to users, the bottom shelf has a clearance of about 4.75” — take this into account depending on what you plan to store there. The product is made from durable stainless steel with a brushed surface to prevent fingerprints, which will keep it looking polished and shiny no matter how much you use it. According to reviews, this turntable is easy to assemble and spins quite easily. Many note that it is the perfect size for storing spices, and you really can’t beat the reasonable price of this unit. If you’re on a mission to organize your pantry or cabinets, the Sagler 2 Tier Lazy Susan Turntable is an invaluable purchase. Trying to tidy up your refrigerator? Then you need a lazy susan to organize all those odds and ends. With a product like the InterDesign Linus Lazy Susan Cabinet Turntable, you’ll be able to more easily store condiments, leftovers and snacks in your fridge, saving you the hassle of rearranging everything when you need an item from the back. This lazy susan measures 14” across and 1.75” tall, but there are a few other sizes available also. The clear plastic design features a thin lip to keep items in place while still maximizing surface area, and the surface of the turntable is textured to minimize slippage. Reviewers say this product spins well, even when loaded with various items. Overall, the InterDesign Linus Lazy Susan gets top marks from users, many of whom say it’s high-quality and incredibly convenient. One person even says this turntable is an item you never knew you needed in your fridge, but that will quickly become an essential. The appearance of your lazy susan doesn’t really matter if you’re using it in a cabinet or the fridge, but if it’s going to be on your kitchen table, you probably want it to be a little more aesthetically pleasing. For an attractive lazy susan that delivers big on functionality, your best bet may be the chic Lipper International 18-Inch Acacia Wood Lazy Susan. 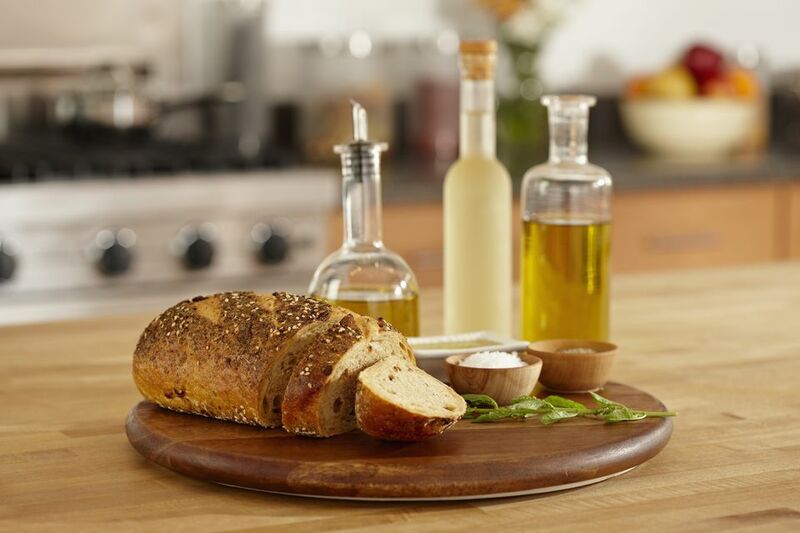 This high-quality wooden lazy susan will look right at home on any kitchen table. It’s 18” in diameter and 1.25” tall, and the sturdy acacia wood construction is resistant to scratches. The turntable is designed to spin 360º in either direction, and it’s perfect for making spices, condiments or small dishes readily accessible. The Lipper International Acacia Wood Lazy Susan is hand-wash only and reviewers say it is versatile and beautiful. Many use the turntable for their fruit bowls and condiments, writing that it’s a lovely addition to any dining room table. Corner cabinets are tricky. On one hand, they are often quite spacious, but if your cabinet doesn’t have shelves, you may not be able to capitalize on all the storage space it has to offer. However, you can remedy this problem with a specially designed corner-cabinet turntable, such as the Rev-A-Shelf® Kidney Shaped 2-Shelf Lazy Susan. This product is designed specifically for use in corner cabinets. It has two “kidney-shaped” tiers that come in a variety of sizes, ranging from 24” to 32” in diameter. The set comes with a telescoping shaft that you can adjust to fit your cabinet, as well as mounting hardware. One of the unique features of this corner-cabinet turntable is that each shelf rotates independently, allowing you to easily find what you’re looking for without turning the whole unit. Reviewers say this product can be a little tricky to install, mostly because of the awkward configuration of corner cabinets. However, once you get it set up, your Rev-A-Shelf® Lazy Susan will maximize storage space in your cabinets, allowing you to easily access every item. If you’re looking for a turntable that’s more of a decorative piece, the Epicureanist Slate Lazy Susan is unmatched in terms of aesthetic appeal. This beautiful lazy susan is made from real stone, and it would be the perfect centerpiece for your next dinner party. The Epicureanist Lazy Susan is just under 16” in diameter and 1” tall. It’s made from real slate and features a rustic, unfinished edge for an organic appearance. The stone sits on a glass base, and the unit is even dishwasher safe. One of the cool things about this lazy susan is that you can write on it with chalk, making it perfect for using as a cheese board or charcuterie platter. It even comes with a piece of chalk to get you started. While this isn’t the most functional lazy susan on the market, it’s definitely a top pick if you’re looking for aesthetic appeal more than anything else. Because it’s made of stone, the price point is higher than many other options, but just think of all the compliments you’ll get on this beautiful stone centerpiece. While traditional lazy susans are an incredibly helpful organizational tool, you can really only load them up with items that stand up on their own. If you want to store snack bags or juice pouches, you’ll need a specially designed product, such as the mDesign Lazy Susan Turntable Organizer. This unique item has high edges and individual storage compartments, giving you even more storage options in your pantry. The mDesign Lazy Susan is 11.5” across and 4.4” tall. The plastic turntable is divided into five compartments, and it spins 360º for all-angle access. Thanks to the various compartments, this product is perfect for storing snack bags, food pouches and other awkwardly shaped items. Reviewers note that they use it to organize kids’ snacks, medications, baby food, tea bags and more — it’s really that versatile. Overall, the mDesign Lazy Susan Turntable Organizer gets high ratings from users, who say it’s well-made and spins nicely. If you’re looking for a product to help organize oddly shaped items, this is definitely the way to go.